Basalt town government’s relocation of residents from the Pan and Fork Mobile Home Park and the overhaul of a rule designed to preserve affordable housing has raised questions among some observers over whether the moves are accelerating gentrification. 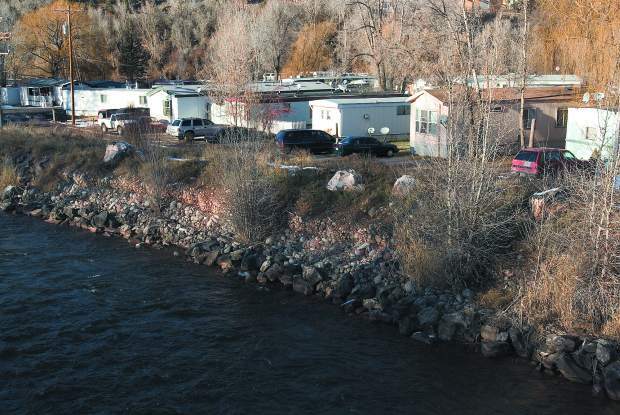 The town is working with owners and occupants of trailer homes at the Pan and Fork to partially compensate them for the loss of housing, and it is helping them find alternative housing. Town Manager Mike Scanlon said the relocations could cost about $1 million. In addition, the Town Council has taken the first step to ease a 14-year-old ordinance that requires developers to replace 100 percent of all free-market affordable housing that they tear down. The new proposal would encourage developers to assist 100 percent of the people they are displacing with new housing, according to Mayor Jacque Whitsitt. If that cannot be accomplished, the new ordinance will require the developer to replace 45 percent of the units torn down. Town officials have repeatedly said both moves are sound policies. Studies commissioned by the town show that the Pan and Fork Mobile Home Park is in the floodplain and imperiled if a huge flood strikes. The town worked with a nonprofit partner to acquire the mobile-home park. It is now negotiating relocations with the first wave of residents and expects 11 trailers to be moved this month. In addition to cash settlements of between $16,000 and $22,000 per unit, town officials are helping residents find alternative housing. At the same time the town is working on relocations for Pan and Fork residents, it is rewriting its rules for replacement housing. The timing raised eyebrows. “The first thing that I thought was, ‘White man speak with forked tongue again,’” said Polly Pollard, a resident of Basalt since 1976. Pollard said she understands the need to relocate residents of the Pan and Fork because of the flood threat. She questions how it was handled. She doesn’t believe residents have been compensated justly and feels they should have been offered replacement housing. “What if it was your household?” she asked. She noted that an affordable-housing project was proposed, but rejected, several years ago near Basalt High School. Town officials in office at the time ruled that it was outside the urban growth boundary. A project like that could have given the Pan and Fork residents a viable alternative, Pollard said. The town government doesn’t necessarily have a moral obligation to find housing for the displaced residents, but it could have been more “considerate,” Pollard said. “The Latinos are people, too,” she said. Town resident Gerry Terwilliger, one of the few residents who have spoken at public hearings regarding the town’s direction, said the rewritten replacement-housing ordinance wouldn’t preserve affordable housing in the long term. If various projects are redeveloped and only 45 percent of the units must be replaced, it’s a loss for the town, he said. “Pretty soon you’ve got nobody left,” Terwilliger said. He has lived in Basalt since 1980 and has seen it evolve from a working-class town to a haven for professionals and affluent homeowners. “How many carpenters do you know that live in Basalt?” Terwilliger asked. He believes the relocation of the Pan and Fork will add to the homogenization of the town. The neighborhood is an important part of the fabric of the town, he said, noting that a lot of kids walk to the schools from the mobile-home park. Both Terwilliger and Pollard said Basalt’s diversity always has been one of its strengths. Diversity, Terwilliger said, leads to sustainability. “I really don’t want more gentrification of Basalt at all,” Pollard said. “I love the diversity in Basalt. One letter writer equated Basalt’s actions to racism, which Scanlon strongly countered. The 100 percent replacement-housing ordinance didn’t do anything to help the Pan and Fork residents, he noted. The ordinance makes a property owner replace units. It doesn’t require owners to try to help the current residents. Basalt town government is trying to help the residents find housing that is better than what they currently live in, Scanlon said. Scanlon also vehemently defended the town’s efforts to add to the affordable-housing stock and preserve socio-economic diversity. The town, through direct action with partners or indirect action, is helping on three affordable-housing projects. The town has committed $750,000 to a proposal for a 66-unit affordable-housing project at Willits Town Center. Archdiocesan Housing Inc., an affiliate of Catholic Charities, is pursing the $20 million project. Basalt and Pitkin County also are exploring an affordable-housing project in the Southside neighborhood of Basalt. Real America Development LLC has applied to build 57 affordable-housing apartments adjacent to Stubbies in Basalt. The town isn’t connected to the project but has been asked to make some concessions in the review process. As a result of those projects, Basalt will have a substantial net gain of affordable-housing units despite the loss of the Pan and Fork, he said.